The carpool dilemma: What's a 'Sh*tty Mom' to do? Let's be real: We all have those moments when we're less than perfect as moms. Sometimes, WAY less than perfect. (Have you ever knowingly sent a sick child to school? Bought store-bought cupcakes for your kid's birthday but passed them off as homemade?) While plenty of books claim to teach the secrets to all-star parenting, now there's a guide for the rest of us: "Sh*tty Mom." Co-written by two TODAY producers, both busy working moms, and their friends, this is a funny parenting "guide" for those of us who admit that our parenting isn't blemish-free. Check out the sh*tty mom approach to carpooling here, and afterwards tell us: What's your sh*tty mom moment? It's a dilemma that makes complete sense to Sh*tty Mom. Your 6-year-old sits in the passenger side of the backseat. Which is why the driver’s side of the backseat is littered with empty Happy Meal boxes, ketchup packets, plastic CVS bags, loose receipts, a phone charger and eight paper coffee cups. In the Carlinesque search for a place for one’s stuff, you found about 20 cubic feet in your car’s backseat. Unfortunately, this “place” is where a 5-year-old girl named Madeline is supposed to sit while you drive her to school. And at this exact moment, Madeline’s mother is pulling up to your house. Remember, you need this carpool. It saves your sanity on the days you don’t have to drive. You can’t lose your spot because Madeline’s mother doesn’t want her daughter sitting on a pile of old French fries and Powerbar wrappers. You have three options, one of them viable. Quickly toss everything into a trash bag and throw it away. The Happy Meal boxes can be recycled. The Target receipt will come in handy when you admit you’re not going to open that Jillian Michaels workout DVD in this lifetime. And old French fries are, let’s face it, still delicious. Throw everything in the front seat. Great idea! Except the front seat is also full of garbage. Older, more senior garbage that can’t be moved because it’s close to getting tenure. That’s why you started throwing the new garbage in the backseat in the first place. Shove the garbage in your kid’s half of the backseat, below his feet. If Ethan’s as good a liar as you are, he’ll keep your secret for the small price of 20 minutes of Angry Birds on your iPhone. Madeline’s mother won’t care as long as Madeline is OK, and dear Madeline will finally have a place to throw her juice box. Tell us a "Sh*tty Mom" moment you have had on our TODAY Moms Facebook page. We may include your answer in an upcoming post on TODAY Moms. 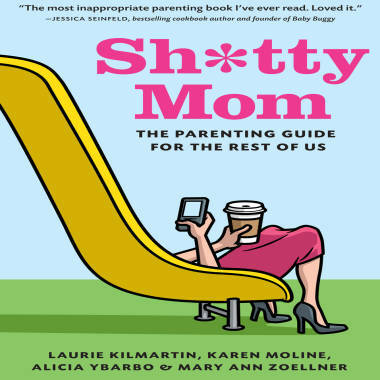 "Sh*tty Mom: The Parenting Guide for the Rest of Us," was written by Laurie Kilmartin, Karen Moline, Alicia Ybarbo and Mary Ann Zoellner. Check out the Sh*tty Mom website, where you can order the book.